In a general and simplified sense, some players take longer to develop (and subsequently break out) than others. But there’s obviously no shortage of examples throughout the sporting world where that breakout never occurred. Is that something that the Philadelphia Phillies should be concerned about in relation to one of their (still) young position players? In a number of different respects, Maikel Franco was the worst third baseman in baseball among qualifiers in 2017. The Phillies third sacker finished with the worst Off rating among the group that features 22 qualifiers, with a -22.4 mark. The second worst figure on the list of qualifiers came from Yolmer Sanchez, at -5.1, and at least he had the defensive game to at least help things balance out a little bit. Within that group, there was only one third baseman that finished with a negative WAR for the season; it was Franco’s -0.5. There was a lot of hope that Franco would break through in 2017 for a Phillies team that folks see as the next up-and-coming product of a total rebuild. While they didn’t take too large a step forward, some of their young players did, and more are on the way. Which certainly murks up the picture for Franco somewhat moving forward. With the production and some of the trends that we’ve seen from the last two years in regard to Franco, though, it’s probably time for current and prospective owners to call it quits on the Phillies’ third baseman. In addition to his paltry Off and WAR figures, Franco ranked at or near the bottom in a number of other respects. His .230 average ranked third-to-last. His .281 OBP ranked at the bottom by about 30 points. His park-adjusted offense came in at 76, which was the worst by about 20. His hard contact rate, at 30.9%, was the third lowest, which was combined with a soft contact rate that was the third highest, at 20.8%. That latter portion did him no favors in regard to his .234 batting average on balls in play, especially when he put the ball on the ground at the second-highest rate among the group (45.4%). That’s a lot of time spent beneath that threshold of 100. The Phillies came into the season talking about adjustments that they had expected Franco to make. Approach was one. Some semblance of consistency on the power side was another. Looking back, it’s extremely difficult to see where those adjustments may have even made an attempt to exist. His Swing% was up at 50.8% and the fourth highest, while he hacked at over 31% of pitches outside of the strike zone (the eighth highest among the group). The only apparent adjustment that was made, in terms of pitch selection, came on breaking pitches. There was a small change in terms of zone coverage, to swinging more at pitches on the outer part of the zone than those on the inside, though even that change is a relatively minuscule one. So, a breakout candidate, coming off of a year in which he failed to meet expectations, and then performed worse in the following campaign. Is there really any reason for optimism at this point? I mean, he did hit .271 and post a wRC+ of 110 in September. The most consistent stretch in the above visual did come toward the end of the season, at least as far as wRC+ is concerned. But until the adjustments or the consistency is displayed, it’s tough to garner any sort of legitimate excitement or intrigue around Franco on a Phillies team that is going to have a lot of it elsewhere. The Phillies still have a little bit of time to let the Franco thing play out before their window officially opens up. Is there a chance that an improving Phillies team could motivate Franco and turn him loose next season? Sure. Is there a chance that a change in leadership (especially on the hitting side, with Matt Stairs’ departure) could lead to a change in vision and approach toward fixing him? Also, sure. But given the output that we’ve seen from him in each of the last two years, it’s extremely difficult to maintain any sort of optimism surrounding Maikel Franco. We hoped you liked reading It’s Probably Time to Give Up on Maikel Franco by Randy Holt! Maikel Franco? Heck, I’ve got friends still waiting for Pat Burrell to break out. For most of the members of my fantasy league, Wieters Watch never ended. Tying the two together – It was my experience of staying on the Weiters train too long that taught me a lesson. 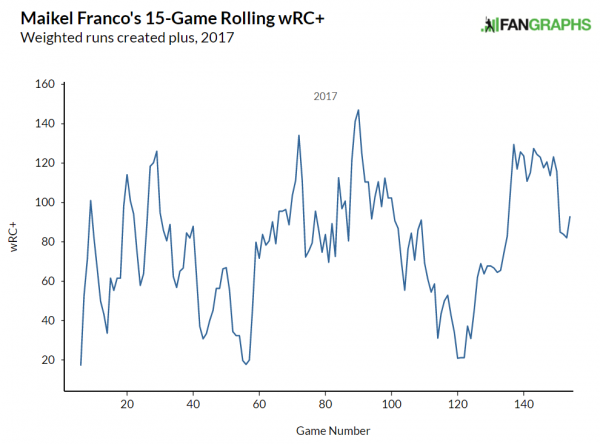 I sold on Franco early in 2017.